Ever since I was a little girl, I have sucked at skipping rope. This thought may not seem relevant to a story about my first attempt at Muay Thai kickboxing, but trust me, it is. The very first minute of the exercise class—offered by FitPlus, a Halifax-based martial arts academy—immediately reminds me of my playground failures as the trainer tells the small group of participants to skip rope until instructed otherwise. I fumble and curse as I catch the rope between my bare toes and behind my head. I’m sure the man at the front desk, who helped me sign up and has a clear view through the studio’s windows, is getting a kick out of watching me struggle like a cat in a pile of yarn. Next thing I know we’re told to do sit-ups, then we’re back to skipping, then we’re on to push-ups, then we’re back to skipping. By this point I’m no longer garrotting myself every 20 seconds, but it’s still not great. The woman beside me looks over sympathetically as I somehow tie up my elbow in the rope. I remind you, I’ve never been good at skipping. Finally, the skipping ends and I look down to find that, somehow, I still have all 10 toes. The instructor splits up the group by experience level—the more seasoned participants go into another room off the main studio, while I and my fellow newcomers hang back. We are asked to pair up with someone of similar size and experience. The only other woman in the class waves me over and we put on our kits—I start with the pads and she starts with the boxing gloves. 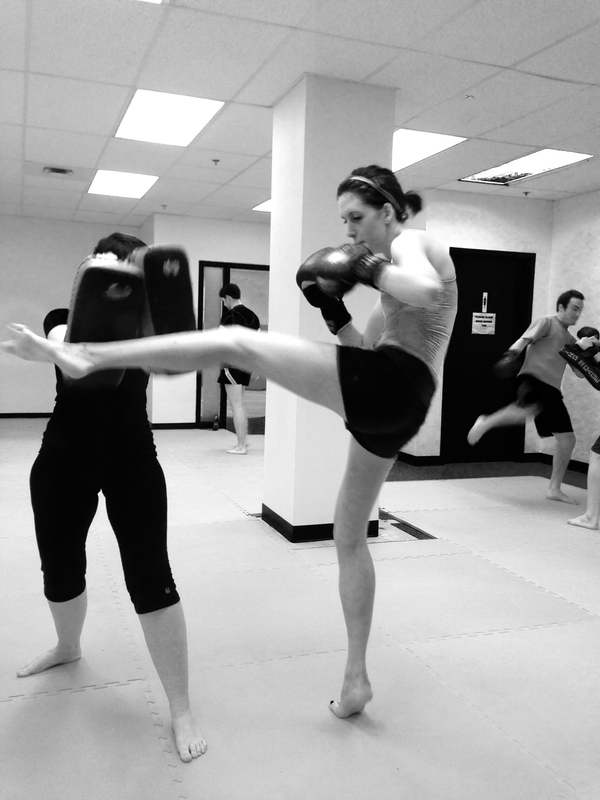 We go through various combinations of punching, kneeing and kicking. All the while my arms are buffering her punches and slowly building up resistance. After more circuits of combos, burpees, sit-ups and push-ups, it’s my turn to do the punching. I awkwardly strap the gloves on and wave the instructor down. If anyone is going to find a way to break anything, it will be me. I ask the trainer for a full demonstration of proper form and execution, which he is more than willing to give. Little does he know, this won’t be the last time I ask for help. My punching is in poor form but, between criticisms from my partner and the instructor, I make slight adjustments until I’m no longer flailing my arms like a crazy lady. Thankfully, years of dancing have given me the leg power to kick high and strong, so that aspect comes more easily. By the end of my turn, I am sweating uncontrollably and my lungs are telling me to stop. But I continue to push through the last bout of cardio, jumping jacks and burpees until the class is done. If nothing else, this class will teach you to jump rope (a lot) and loosen up. If you’d like to give their 30 day free trial a go, visit their website at www.fitplusmma.com.